Totally Certified has never been a quiet brand. From its inception in 1997, then as a part of the Pinnacle family, it offered bold foil design. The bold tradition continues with 2012 Panini Totally Certified Football. A lot has changed since 1997, but the colorful etched foundation of the base set isn't one of them. Every pack comes with either an autograph or memorabilia card. 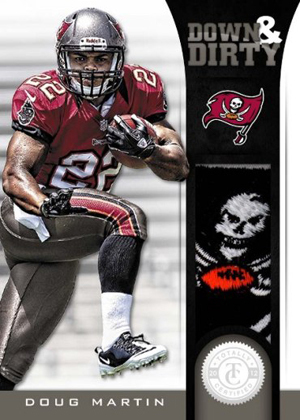 The 2012 Panini Totally Certified Football set has 235 cards. A total of 100 veterans and retired legends make up the base set. Another 100 cards make up the Freshman Phenom Autographs subset, all of which are numbered to 299 or less. Finally, many key rookies are among the 35 Freshman Fabric Rookie cards, which have both an on-card autograph and a jersey swatch. 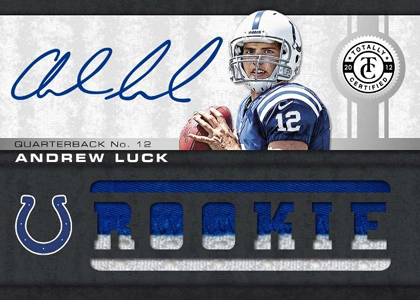 Freshman Fabric Rookies are numbered to 199 or less fall one per box. 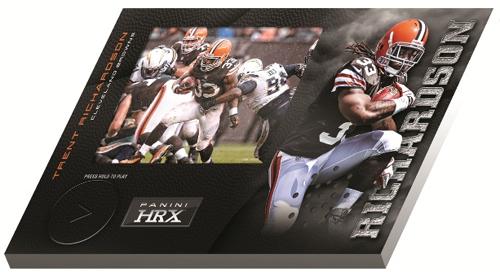 HRX Video Cards have become a staple for the Totally Certified brand. They return with new video footage. Adding to the chase are autographed versions numbered to 10 and one-of-one 14k Gold Autographs. Rookies play a big role in the hits outside of the main set as well. 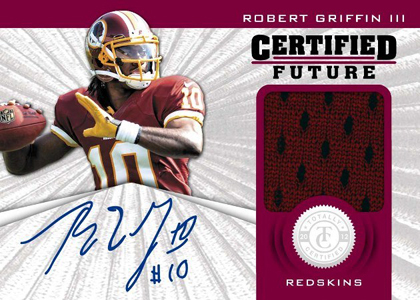 Numbered to 175, Certified Future includes both a jersey swatch and an autograph. Prime versions, which have premium swatches, are numbered to 49. Freshman Fabric Platinum Red Signatures come hard-signed with an over-sized memorabilia swatch. Numbering varies from 199 down to 1. 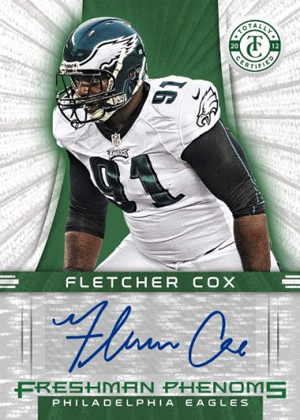 Certified Future Signature Materials (#/175 or less) also have on-card autographs. Retired players appear in Stitches in Time, a memorabilia-based insert that has up to four swatches and are limited to 199 or less. Team Panini Signature Materials are among the rarest inserts in the set, numbered to 50 or less. Besides the promised Freshman Fabric Rookie, 2012 Panini Totally Certified Football boxes deliver five additional hits including at least one autograph. Kind of curious about the hits in these. I thought it was 4 but your site states 6. Also curious if there is anything new on release date? Dale Leavitt � It looks like March 6 is the latest release date. I just double-checked with Dave and Adam’s and they have the same hit info as us: 1 on-card autograph, 1 other autograph and 4 additional autographs or memorabilia cards. What is a box going to cost? Cards look sweet from what I have seen. Dennis Gronau � Probably about $110-120 at release. Having a memorabilia card, auto card, and or both makes this Panini Product a standout among hobby boxes. Having the opportunity in opening the foil packs, this is a rarity, I noticed a greater number of veteran cards. Most hobby boxes tend to favor rookie players, although this set has a few rookies, the majority of each pack are heavy with veterans. I enjoy having a heavy veteran set, as opposed to rookies. The cards are nicely decorated and the background is very clean. All of the base cards are done at such a high level, it makes the base set look like hits! As for the hits? Two autos (B.J. Cunningham and Nick Perry) were followed by a Ryan Broyles relic auto. Three relics were also included in this set, making this a very well thought out product. The relics were a mix of veteran and rookies. Drew Brees, Super Bowl champion Joe Flacco (Platinum Blue), and a jumbo jersey card of Bernard Pierce! This is another product from Panini that I highly recommend from a standpoint of a entry level collector like my self, to a seasoned collector! A job well done. My wife has gone from ripping packs to a full fledge collector! I thought I was addicted, my wife is “Totally Insane for Totally Certified”! She has purchased her 4th hobby box of Totally Certified and now refuses to purchase any retail products! In her defense, she made a really great choice and got one of the biggest hits for us, a 2012 Panini Black 2 color auto in gold ink of Andrew Luck. She insist that the next big hit must be a RGIII relic auto. Hence her recent purchases of 4 hobby boxes of Totally Certified. Although she has yet to find her RGIII auto hit, (She already owns a Panini Limited Jumbo Patch RGIII & Panini Crown Royale Relic RGIII) let me share with everyone, her Totally fantastic hits, pun intended. Besides the base cards of which my review described how Panini had taken extra steps in producing such a high quality base card via the etching technique, her hits were; T.J. Graham auto relic, C. Sensabaugh “Freshman Phenom” blue auto, N. Goode “Freshman Phenom” blue auto, O. Bolden red auto, B. Brown red auto, and my favorite A. Morris red auto! She received her first redemption, actually two. Let me add that this whole redemption process does not please her at all! The redemptions are as follows; J. Lane “Freshman Phenom” red auto, and her second all time big hit; Russell Wilson “Freshman Phenom” red auto. Prior to her purchase of Totally Certified hobby box #4, she was looking over a 2012 Panini Playbook, my immediate comment was; “there are 4 packs, each pack has 1 card. That is a $190.00 hobby box of 4 cards. She then turned to me and said; “Well, next month is our 20th anniversary”. 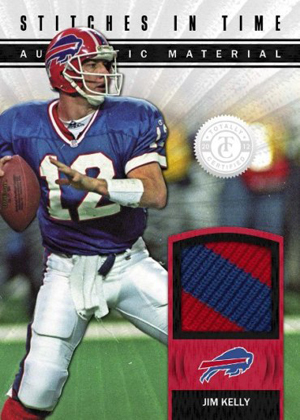 I was actually chasing down a 1992 Topps Stadium Club High Series set with the high priced Brett Favre card! Let me inform everyone; “I did not say yes, nor did I say no”! I politely told her; “Anything you want honey, you’re the boss”. In summation, this is the key to a 20 year marriage! Oh yes, one more thing, I’m always wrong and she is right! If I seem whipped, understand that I get to watch every football game during the season with absolutely no interruptions and I have a hell of a Totally Certified collection! Need I say more? 3 days later hit Richardson hrx auto /10!